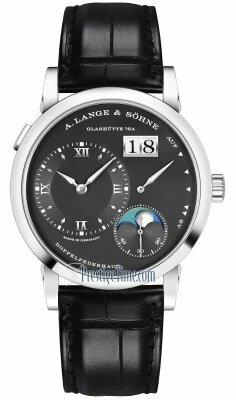 Buy an A. Lange & Sohne watch at discounted prices from Prestige Time. Large selection in stock. A. Lange Söhne watches utilize some of the most painstakingly intense handmade processes to create their A Lange Söhne timepieces. 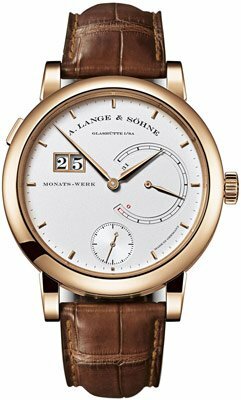 From the classic Lange 1, Lange Tourbillon and Lange 1815 to the Lange Zeitwerk and Lange Saxonia, one can always expect unparalleled artisanship and craftsmanship when you buy a Lange & Söhne watch. Enjoy 5 star service and Free Shipping! A Lange & Sohne watches is a company rich in history and tradition. Established in homeland Saxony, A Lange Söhne timepieces are intertwined with the splendor of their surroundings. 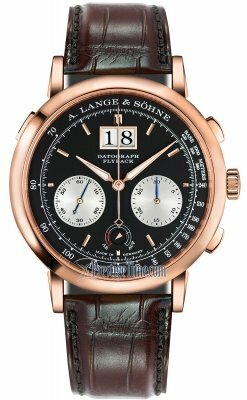 Dating back 165 years to F.A Lange, A Lange & Söhne Company has been producing arguably the best watches in the world. 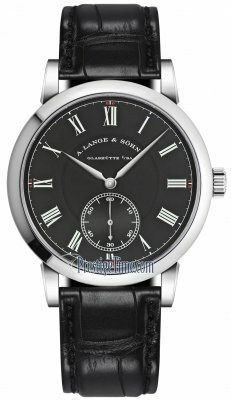 The classic "Lange 1" model represents the story of the company. Lange & Sohne Watches almost closed their doors during WWII, but after the fall of the wall and the reuniting of Germany, Walter Lange and a small group of Artisans began creating their specialty masterpieces once again. The Lange 1 was the first piece to be created in the new Era. 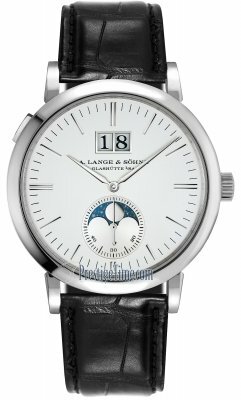 Other popular models from Lange & Söhne include: The Grand Lange 1, Lange 1 Moonphase, Lange 1 Time zone, Saxonia , Saxonia Automatik, Richard Lange, 31, Langematik Perpetual, Datograph, Double Split, Tourbograph "Pour le Merite", Cabaret, Arkade and the new 1815 collection. Using the innovations of Zero Reset, Fusee and Chain Transmission, Lange balance spring, Flyback, Precisely Jumping Minute counter, Double Rattrapante with disengagement feature, outsize date feature each piece is an outstanding example of precision caliber mechanics truly remarkable wrist watches. A Lange Söhne established themselves as the premier watchmaker of today. The long and exhausting manufacturing process used in A Lange Söhne watches are not for the impatient or fainthearted type of person. It takes a special type of personality in an artisan to devote so many hours, days and months to produce the components used in a Lange Söhne watch. They pay tremendous attention to detail and their engineering fuses the age old wisdom of watchmaking with the latest technology producing A Lang Söhne watches that are each a masterpiece in and of itself. 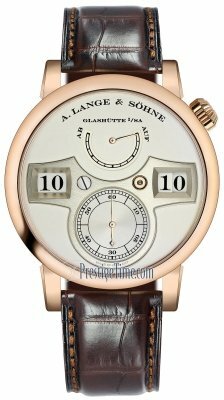 The A. Lange Söhne 1 is a perfect example of how a 165 years ago, an company like A. Lange und Söhne in Saxony can grow to become the manufacturer what is possibly the best watch in the world. 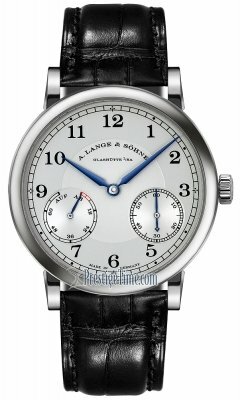 Lange and Söhne movements are exquisitely decorated and aesthetically pleasing with their unique and rigorous artisanal standards which employ many processes of finishing and engraving on each component of the watch be it visible through the crystal of a Lange watch or not. One of which is the special Lange-style floral pattern. Ribbing (a pattern of equal stripes) can be found on the Â¾ plate and the sides of the back of the case of a Lange caliber. Solarisation is another intricate pattern found on A. Lange and Söhne watches . These are mainly found on the mainspring barrels, wheels and other round surfaced components. Perlage, a decoration resembling overlapping clouds can be found on the surface of bridges and plates. This decoration is applied using an abrasive rotating peg and progresses from outwards inwards with each cloud overlapping the one before it. The steel clicks are finished with a straight grain finish which is produced with a type of sandpaper and goes from edge to edge. Circular graining can be spotted on the smaller wheels of an A. Lange Söhne watch by spinning the wheel on a special abrasive surface. A more hands-on finish is the circumferential polishing which embellishes the edge of the frame elements on the Lange movement. This is a manually applied finish using an abrasive peg using a special rotary tool. The finisseurs at A. Lange and Söhne watches manufactory can easily spend up to two hours just to give the surfaces of a whiplash spring the mirror polishing that it has. This is a painstaking task that requires tremendous concentration and focus for even the slightest particle of dust can cause the finisseur to lose hours of work. A. Lange & Söhne movements are embellished with a traditional floral motif which produce a harmonic balance of light and shadow on the polished surface of A. Lange and Sohne watches. The three-quarter plate also has many distinct qualities and characteristics. Many unique hand engraved patterns can be found throughout the A. Lange and Söhne watch which include flower petals and other floral patterns. Each pattern is crafted with a unique hand-made engraving, an unmistakable feature of A. Lange and Sohne timepieces, a watch like no other. While respecting the age-old tradition that his father bestowed upon him, Walter Lange is a firm believer that innovation is also key to success, that staying in one place is the same as moving backwards. Just like time itself, in the world of watchmaking, things must always move forward a manifestation seen with luxury watches such as the Lange 1, the Lange Zeitwerk , and the Lange Tourbillon , lange 1815 and Lange Saxonia. While traditional materials such as untreated German silver 18 carat gold and blued screw are still found in A. Lange and Sohne watches. In 2015, at Watches & Wonders, Lange Söhne CEO, Wilhelm Schmid announced the F. A. Lange's 200th birthday. On August 26, 2015, Saxony's Prime Minister Angela Merkel, the German Chancellor inaugurated the new, CO2 free, energy efficient Lange Building. This is A. Lange & Söhne's biggest investment to date and is a testament to their investment in the company's future and underscores their commitment to the environment and commitment to Glashutte as a site for production.